The GFPIII is a general purpose, modulated, fibre optic fluorometer available with a choice of filter sets tuned to fit your fluorescence requirements. Popular selections are filters for Green fluorescent protein, Rhodamine, Chlorophyll and Fluoroscein. The supplied, flexible fibre optic probe enables the GFP to be used with solid, liquid or gaseous samples. 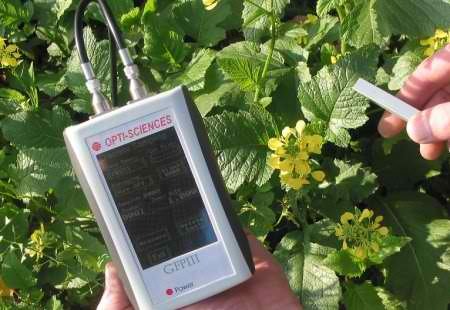 The GFP meter is compact, lightweight (275g), battery powered and has a weatherproof membrane keypad, making it an ideal field portable measurement system. The integral data logger allows the storage of over 2Gb of readings along with the time of measurement and a calibration status stamp. These readings can be separated into different file locations for easy identification. For monitoring applications, auto logging is possible with rates from 1 per second to 1 per minute. The GFPIII will detect Fluorescein down to at least 10 ppb in pure water and Rhodamine to less than 30 ppb in pure water. For simple data transfer, the GFP is supplied with a USB port and computer cable.